With regular service to London Waterloo from a train station located just a two-minute walk away this centre offers great transport links as well as a fully furnished professional environment for your new office space. 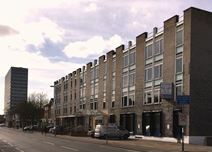 Agreements from just three months are available at this centre. The nearby high-street has a range of amenities, including some excellent restaurants, such as the Greenhouse gastro pub. Consisting of two buildings, this centre provides light, spacious offices and workshop and industrial space to suit a range of business types and sizes. A range of facilities are available, and the location is easily accessible, being just 30 minutes from Heathrow Airport, within walking distance of new Malden Railway Station. Cafes, bars and restaurants are in the local area, as well as supermarkets and banks.